The Cats of Ashton Hall: Alien Invasion!!! Socks Cat here with LIVE breaking news! Ashton Hall has been invaded by a currently unknown number of small furry balls which smell and sound remarkably like kittens. I have not been able to ascertain particulars due to the fact that the interlopers are presently under quarantine until a vet can check them out. The aliens have commandered the front bathroom, MY front bathroom! We took it in turns and stood guard outside the closed door all night and were successful in not allowing any of them to get out. Where did these kittens come from and how long will they stay? For the answers we go to senior cat-correspondant Freckles. Freckles: "tHems coMes in A box." Socks: Um, yes, thank you Freckles. Prehaps Grace can help us. Socks: Alright, let's see, Riker, do you have any further information on the kitten situation? Riker: Yes mom, I do. I had a great vantage point from the front window. A call came in about 3:00 in the afternoon from a neighbor girl who claimed to be having some sort of feline emergency. Girlchild responded to the call and found four abandoned kittens in a neighbor's backyard. She in her turn put in a call to Ashton headquarters and requested backup. Mum Ashton arrived on the scene with a cat carrier. . .
Riker: Yes, Freckles, with your box. Upon arriving at the scene Mum realized that there were actually 5 kittens, not four. A merry chase insued in which Mum banged her head several times, and everyone involved ended up sweaty and dusty. One kitten, a fiesty orange fellow, slipped past the rescue team and into another neighbor's yard. Twenty-four hours later, the orange one is still at large. Socks: Thank you Riker, but I need to interupt you. We have some breaking news just in from our correspondant at the scene. Tashi, what do you have for us? Tashi: Well Socks, I've been entrenched here outside the bathroom for the last hour and I managed to get our secret camera robot past the human blockade to snap this picture for us. 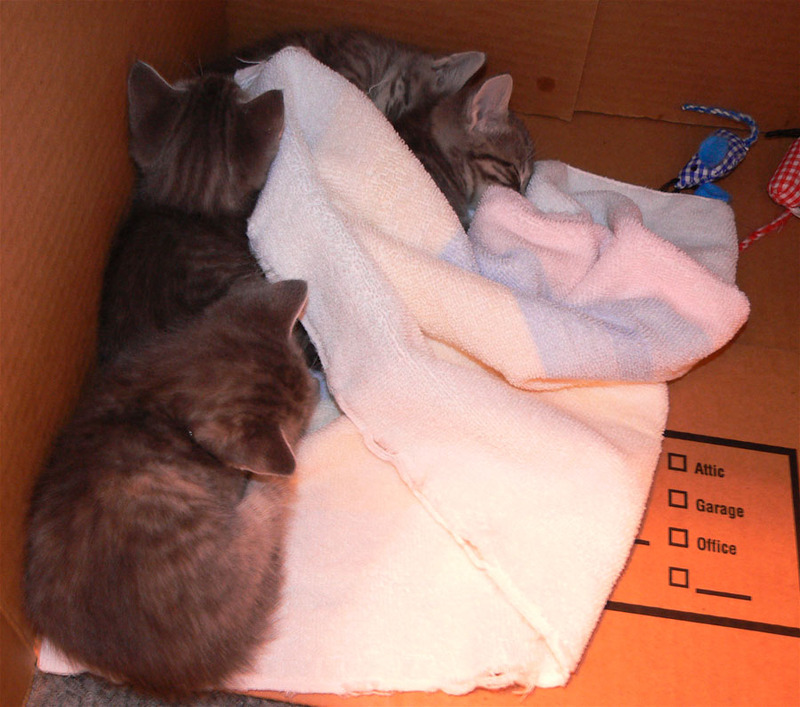 As you can see there appear to be four gray tabby kittens sleeping peacefully in a cardboard box. Freckles, you will be glad to note that your carrier has been returned to you. Back to you Socks. Socks: Thank you Tashi for your amazing bravery in the field. Well folks, that's what we know for now. Mum tells me the vet visit is scheduled for Tuesday. I wonder what lies ahead?! Stay tuned for the latest in breaking news. Socks out. Laugh! That is wonderful! The kittens are soooooo soft! I have missed having kittens in the house. Classic Cat Radio - "The Trout"